How to Write 5000 Words a Day — RETREAT! It was my friend’s idea for me to escape for a few days on a writing retreat. I had been complaining about the slow progress of my latest novel and she suggested I go away somewhere and get away from it all. That’s it, I thought. I’ll go on a writing retreat. It was the perfect time. My novel had passed the halfway mark. I knew where it was going and could only benefit from the chance to focus wholly on my script. A quick Internet search and I was booked on a three-day retreat in Devon with Urban Writers’ Retreats. Of course there’s never a good time to leave your family. The dog was depressed. He’d just been neutered and had a plastic cone round his head to stop him licking his wound. My youngest had exams all week and my eldest was having her braces fitted, while my other half had his usual work commitments. Oh well, they will all have to cope, I thought. There’s not much you can do when you’re nearly 200 miles away in a grade II listed Georgian farmhouse enjoying beautiful surroundings and home cooked food. I got off to a good start, writing 2000 words on the train down and that was in spite of the stunning views as the track hugs the Devonshire coast towards Newton Abbot. I arrived in rain. It rains a lot in Devon, but that’s OK. Sunshine can be a distraction, as can a backyard full of donkeys, sheep, goats and hens. In fact, anything can be a distraction if you allow it to be. I set myself a goal: 5000 words a day. It was doable, I was sure, even if the view from my bedroom was of rolling hills and aforementioned farm animals. Woken by the sound of cockerels or donkeys. Breakfast at 8ish – I opted for homemade granola (Urban Writers’ Retreats’ founder Charlie Haynes cooks everything from scratch and all the food was delicious). Afternoon tea with homemade cake at 4.30pm. Chill in room and call home to check no disasters. Dinner at 8pm with the other writers and a few glasses of wine. It was bliss. Over the three days I wrote over 18,000 words longhand and even managed to nip out for a few short walks across the farmland and into the local village. The days were productive and the evenings sociable as we dined together, and got to know the other writers who had travelled from as far afield as Dubai and New York. Meanwhile, back home, the dog (head cone removed) had overcome his depression, youngest had completed her exams and eldest had braces fitted. Other half (a perfectly able cook) had opted for restaurants or takeaways — understandable after a full day’s work, although not advisable long-term. On my desk there now sits a pile of A4 covered in my scrawled handwriting. Those three days away have certainly increased my word count, but is it any good and would I go again? There’s a whole industry out there keen to make a profit out of writers and over the years I’ve spent a fair amount of money on writing courses (including an MA), conferences and literary events, and I’m reluctant to spend any more. However, I found the whole retreat experience hugely beneficial. It has moved my novel on far quicker than I could have managed at home and as a result I am close to completing the first draft. Writing fast (or faster than normal) can add extra energy to the work, hopefully adding some extra zing and a few unexpected turns. Although in all likelihood more editing may be needed later on. If I had gone in the early stages of my novel I may well have spent three days staring at the farm’s cats and cockerels out of the window, but at this later stage it has proved immensely useful and I would certainly go again. In fact, I’ve already warned Other Half that all future novels may well require a few days away. He’s stockpiling takeaway menus as I write. It’s good to be missed. The Coop’s Jacqui Hazell was born and brought up in Hampshire, England, where there was a foxhole at the end of her garden. It led to a wild, overgrown orchard and Jacqui thinks this early joy in trespassing contributed to her ongoing love of entering other unknown worlds. Art was her first chosen escape from the mundanity of suburbia. She studied at Winchester College of Art and Nottingham before moving to London where she spent a miserable month working as a secretary at Buckingham Palace. There then followed work as a greetings cards designer, journalist and magazine editor. Her short stories have been published in various anthologies and shortlisted for the Jane Austen Award. She has an MA in creative writing from Royal Holloway, University of London. She writes novels, short stories and children’s fiction. She lives in London with her family and Basil the dog-that-looks-like-a-fox. My writer’s block has been going on awhile. When I visualize this “block”, I see myself in a 4-sided brick structure that I’ve resurrected myself, all alone, no assistance. And I always see a brick or two, unsteady at the stop, about to fall right on me. While I’ve never been literally struck in the head and fallen into a coma, my writer’s block feels like one of those precarious bricks at the very top has fallen on my head and struck me unconscious, rendering me silent. Go ahead and head-shrink me. Clearly, I have some issues. I had a brief “awakening” recently (think of the Robert De Niro movie with the self-same title) when Sharon Creech gave her keynote speech at the NESCBWI, 2013 conference I attended a few weeks ago. As Ms. Creech spoke to us, an audience that filled a giant ballroom of the Hilton, I jotted snippets of her speech into my notebook. Each nugget of wisdom jolted me, and by the end, I woke from my writer’s block induced comma. The story she opened with contained the words “frantic excitement” and those words were from a young reader who wrote to her about her own work being published and how she felt this “frantic excitement” about her work being out there for the world. Those words moved Ms. Creech, but more importantly, they moved me. When Ms. Creech spoke them, this flicker inside me, a memory-flame of myself, age 11. Frantically writing in a yellow five-subject notebook, the spark of an idea so crackling, I wrote dozens of pages with “frantic excitement” in just a few days. . . I scribbled those words in my notebook but without any context. I don’t know what the words are connected to in Ms. Creech’s speech. But I heard them and another flicker crackled inside me. Another, more recent memory. . .This past November during NaNoWriMo. Racing to my computer between all the duties of a working-from-home-mother, just to type the words to a new novel. Each day of that month I rode this internal, intense, aching need to GET THE STORY OUT. No judgment. No evaluation. No worry. The intense need so scorching, that I couldn’t hear the voices in my head of doubt and fear, I was so distracted by the burn of needing to write. The only full sentence of all the notes I scribbled onto the lined pages of my composition pad. And these words filled my entire body with an energy that glowed warm and soft inside. The deadness of my creative mind plumping up with life. The energy pouring out of me and easily vaporizing the brick wall of writer’s block. That afternoon and evening, I wrote. I went into the current three WIPS I’ve been working on and started to revise the opening pages. The energy from Sharon’s speech stayed with me, and I typed, feeling a surge of simpatico with myself with what was happening in my head and on the computer screen. It was, in a word, lovely. After I returned home, I watched myself put bricks up, one by one, with each passing day. Once again, I was walled in on all sides. Like a silent prayer, I say the words to myself as I remove each brick one by one. Soon the only walls that surround me are walls of words, inspiring me. Thank you, Sharon Creech. Thank you. Hannah R. Goodman has published young adult short stories on Amazon’s Shorts, in an anthology entitled Bound Is The Bewitching Lilith, and in the journal Balancing The Tides. She has an MFA in Writing for Young People from Pine Manor College’s Solstice program. Recently, she established Sucker Literary Magazine for emerging writers of YA fiction, which was featured in Publisher’s Weekly. A former high school English teacher, she now owns her own small company, The Write Touch. Hannah is a member of the Editorial Freelancers Association and SCBWI. She resides in Bristol, RI with her husband, two daughters, and three cats: Lester, Maisey, and Judy. or on her blog Writerwoman. The freelance editors below are all highly recommended for help with advanced kidlit middle-grade and YA novel manuscripts. This is by no means an exhaustive list. They have all worked with “big house” (not prison) traditional publishers and they all do early and late editing, which are called: “broad strokes“ “big picture,” “developmental editing,” “substantive editing,” “line editing,” and “copy editing.” Many also offer other services including query and synopsis editing, book doctoring, and career strategy consulting. In addition, most work with picture and chapter books through YA , and some with nonfiction and adult. 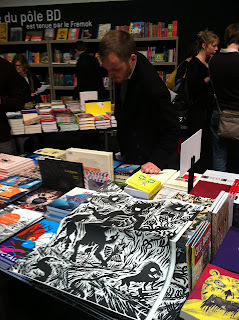 Most also work with illustrators, agents and publishers. Starting prices are based on a 40K word middle-grade novel and include an in-depth editorial letter, usually notes on your ms., and often phone consultations. More words cost more money. Most need at least two months for turn-around. Contact them directly for more information. N.B. As the focus here is on novels, know that the SCBWI Freelance Editors Directory includes a broader range of accomplished author/editors and picture book specialists such as veteran writing coach Esther Hershenhorn and editor/industry insider, Harold Underdown. Catherine was an Executive Editor at Viking Children’s Books, a division of Penguin Books for Young Readers, before returning to New Orleans. She has edited many award-winning fiction and nonfiction children’s books from board books through YA. She works with all age groups and genres, although admits a soft spot for contemporary YA fiction and novels in verse for any age. Contact her for a free initial evaluation and a suggested plan of action. Smaller projects are billed at $85/hour, novels at a flat fee starting at $2500, adjustable according to size and scope of the project. Novel ms. editing includes detailed editorial feedback, line editing, and multiple revisions if necessary. She also offers proposal, query, and synopsis evaluations and career consulting. Contact her directly at: Catherine AT editedbycatherine DOT com. AKA DearEditor.com, Deborah was an editor for Harcourt Children’s Books before becoming the award-winning author of Writing Young Adult Fiction for Dummies. She is a YA and picture book author, too. Deborah charges $90/hour for “substantive“ or line editing. Contact her for a free estimate of total hours required, or to discuss other editorial services such as query letter review, copyediting, proofreading, etc. She estimates for 40,000-word MG ms., spending 6 to 7 hours ($630) for a substantive edit–focusing on plot, characterization, voice and marketability. Line editing would be more like 12 hours. A line edit comes when all the other elements are nailed down. Turnaround time is usually a couple of months. Contact her at: Deborah AT DeborahHalverson DOT com. Emma is the former Vice President and Publisher of Atheneum Books for Young Readers and Margaret K. McElderry Books, imprints of Simon & Schuster Children’s Publishing. 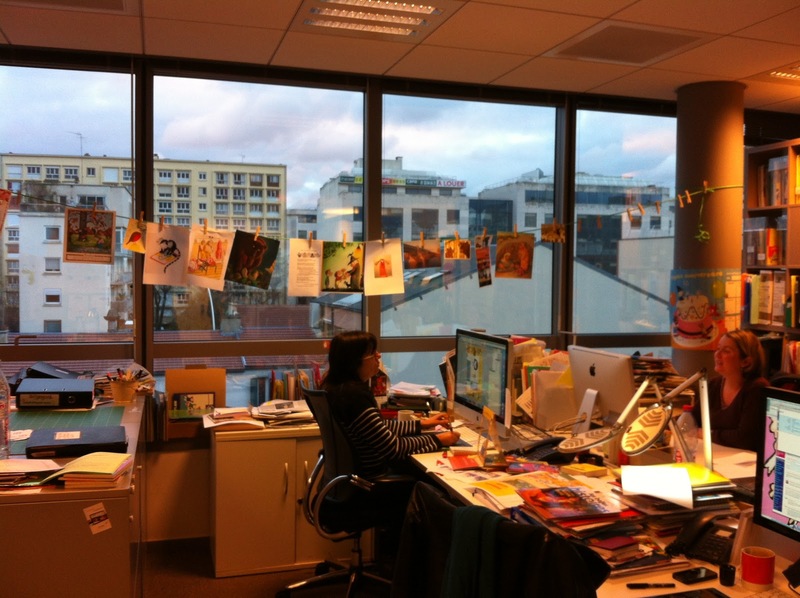 She is the editor of over 500 awarded, honored and nominated children’s books for all ages, picture books to YA. A former freelance copyeditor for Tricycle Press/Random House, Erin also provides editorial assessment, and developmental editing–an ongoing exchange between writer and editor. She especially enjoys working with YA and fantasy. Please query her for a project quote if you are interested in developmental editing or an editorial assessment. She also edits query letters, synopses, and cover letters. Line Editing: $50 per hour Copyediting: $35-$40 per hour. Proofreading: $30-$35 per hour. 1-On-1 is a manuscript consulting service offered through Children’s Book Insider. Laura Backes, publisher of Children’s Book Insider, the Newsletter for Children’s Writers, has worked in the field for 25 years, including with Ballantine and Farrar, Straus & Giroux. She is also a former literary agent and an author herself. Laura has critiqued over 2000 manuscripts, picture books through young adult, fiction and nonfiction. She works with all kidlit age groups and genres. Free Expressions could have been included in the workshop/retreats of Part 1, as they offer a dazzling array of weeklong and weekend novel workshops for groups and individuals, though geared more to process rather than editing a whole advanced novel draft. Lorin Oberweger founded the company in 1995 and works closely with literary agent Donald Maas and other writing and storytelling luminaries such as Chris Vogler and James Scott Bell. She also offers whole novel editing for $2375 (up to 400 pages—a 40K word ms. may be less), and two-part novel editing that includes an initial editorial letter + phone consultation, and then after you’ve revised, full line-editing, another consultation, plus a review of your synopsis/query letter for $2975. A 100-page ms. starts at $825, $7/page thereafter. Partial evaluations and per page pricing are also available. Contact her at lorin AT free-expressions DOT com. Tamson is a former Senior Editor at Disney Hyperion and now a picture book author and editorial consultant. She especially likes middle-grade and boy-oriented (funny, adventurous, quirky) fiction, but edits all kidlit from picture books through YA. Tamson also enjoys giving presentations to groups and classes. Intensive edits of novels of 40K words to 100K, with or without a follow-up read, run from $2000 to $4800. SCBWI members may be eligible for a discount. 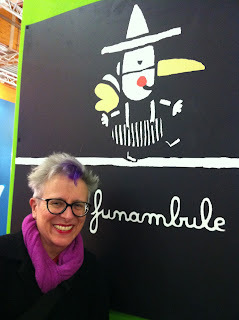 She also edits picture books and offers book doctoring and publishing strategy services. Contact info at her site. Tony has been in the kidlit business in the UK for over 30 years. He has written and published hundreds of books, and edited numerous novels and anthologies of short stories and poetry. He also reviews kidlit and teaches writing for children. Tony will read, assess and make recommendations for a novel up to 80K words, starting at 360 Pounds. He will reread the revision for two-thirds the price, or 240 pounds. Recently returned to the US, Ann Jacobus lived for seventeen years in Europe and the Middle East. Her passion for stories, however, was nurtured by school librarians in Little Rock, Arkansas. She graduated from Dartmouth College, and earned an MFA in Writing for Children from Vermont College of Fine Arts. She writes YA and middle-grade fiction, teaches writing for children, reads kid lit submissions for Hunger Mountain literary magazine and for the Katherine Paterson Prize, and presents at graduate conferences in the US and Canada. Ann’s story, “In Her Hand,” was published in the anthology, Lines in the Sand: New Writing on War and Peace. She blogs regularly at Readerkidz. She and her family and their dog, Louie, live in San Francisco. The difference between a well-written manuscript that “has potential” and one that is “ready for the sales catalog,” can be deep and wide. And the bad news is that a debut YA or MG novel manuscript needs to be essentially, almost, publishable as-is in order to sell. Kidlit writers are ideally revising novel manuscripts with the help of a good writing group and/or other readers, and certainly with editorial input from their literary agent. Also, Martha Alderson’s PLOT WHISPERER series, and Darcy Pattison’s NOVEL METAMORPHOSIS are excellent self-help tools throughout the process. For those writers without agents, as well as those with, a professional whole-novel edit can take a manuscript another big step–maybe the final one to a contract. Whole-novel expertise is increasingly available through workshops, retreats, and directly from freelancers. A novel writer’s challenge now is choosing editorial help depending on budgets, timelines, and the work-in-progress. Services offered and prices vary. Options are summarized below in Part 1 for retreats and workshops. Part 2 (tomorrow) is a list of individual freelance editors with a summary of their services and rates. The Highlights Foundation Whole Novel Workshops offer writers the opportunity to have the entire draft of a novel read and critiqued prior to the workshop, followed by a week of intense, one-on-one mentoring. Excellent food, comfortable single accommodations, and uninterrupted time to revise are part of the deal. Upcoming workshops in 2013: Whole-novel middle grade: March 3-9, 2013, Whole novel YA, Aug 4–10, 2013 (with Cynthia and Greg Leitich Smith) Check the website for upcoming faculty, as well as many other weeklong workshops Including several for nonfiction, biography, novels in verse, workshops for illustrators, etc. LOCATION: Honesdale, Pennsylvania–Founders’ farmhouse, 21 cabins and a 5,200-square-foot conference center known as The Barn at Boyds Mills. CONTACT: Jo Lloyd. jo DOT Lloyd AT highlightsfoundation DOT org, and/or download an application from the site. namelos (yes, lower case) is the publishing/editorial development company founded by Stephen Roxburgh who has been editing for 35 years including as Senior Vice President and Publisher of Children’s Literature at Farrar, Straus and Giroux, and as President and Publisher of Front Street Books. He founded namelos in 2009. FACULTY: Stephen Roxburgh, Author Carolyn Coman, Editors Joy Neaves, and Karen Klockner. One faculty will read and edit a participant’s manuscript in advance of the weekend workshop, then meet one-on-one for an hour or two half-hours each day. Writers take part in group sessions on topics such as plot, storyboarding, theme, and voice. Limited to 18 writers. LOCATION: Rolling Ridge Retreat and Conference Center, North Andover, MA (October of 2013 planned for Asheville, NC.). COST: The price for the conference plus a single room and all meals is $1,250. CONTACT: Roxburgh AT namelos DOT com. The PCCW’s whole novel seminar is an intimate, open clinic format for 16 advanced/published international writers. Selected whole novels are critiqued by a top-level editor or “editorial” agent (written critiques, plus two in-person consults). Also offered: critiques of partials by editor and agent, as well as critiques by teen readers. Enrollees may read peers’ manuscripts in advance, observe faculty consults, and take part in in-depth craft sessions. FACULTY: Various top editors, authors and agents. The 2013 faculty will be announced in late January. TOMORROW: Part 2 – highly recommended kidlit novel freelance editors. Recently returned to the US, Ann Jacobus lived for seventeen years in Europe and the Middle East. Her passion for stories, however, was nurtured by school librarians in Little Rock, Arkansas. She graduated from Dartmouth College, and earned an MFA in Writing for Children from Vermont College of Fine Arts. She writes YA and middle grade fiction, teaches writing for children, reads kid lit submissions for Hunger Mountain literary magazine and for the Katherine Paterson Prize, and presents at graduate conferences in the US and Canada. Ann’s story, “In Her Hand,” was published in the anthology, Lines in the Sand: New Writing on War and Peace. She blogs regularly at Readerkidz. She and her family and their dog, Louie, live in San Francisco. It’s all Hen House Rock-n-Roll (and Positive Leaps) in 2013! The buzz from SCBWI Winchester conference is still ringing in my head: Debi Gliori’s heartfelt keynote speech and workshop, Eric Huang’s enlightening explanation of Transmedia, hosted and reported on by Nick Cross, useful branding tips from author Justin Somper and PJ Norman of Author Profile, performance training from school visitor extraordinaire Steve Hartley, author-actor Mo O’Hara, and finally the best ever group book launch hosted by the inimitable Lin Oliver co-founder of SCBWI. 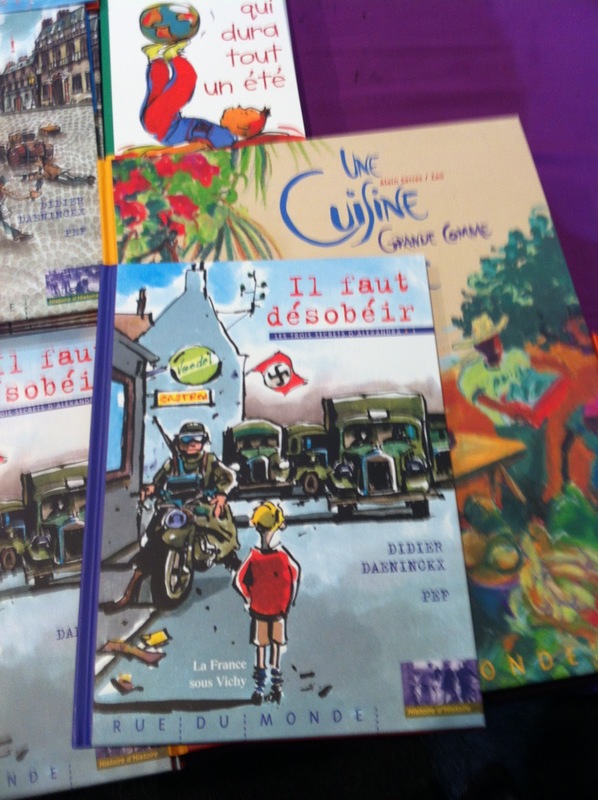 Three days later I was on a (thankfully restful) train to Paris, preparing for more buzz at the Salon du Livre et de la Presse Jeunesse, the French national kids book fair. 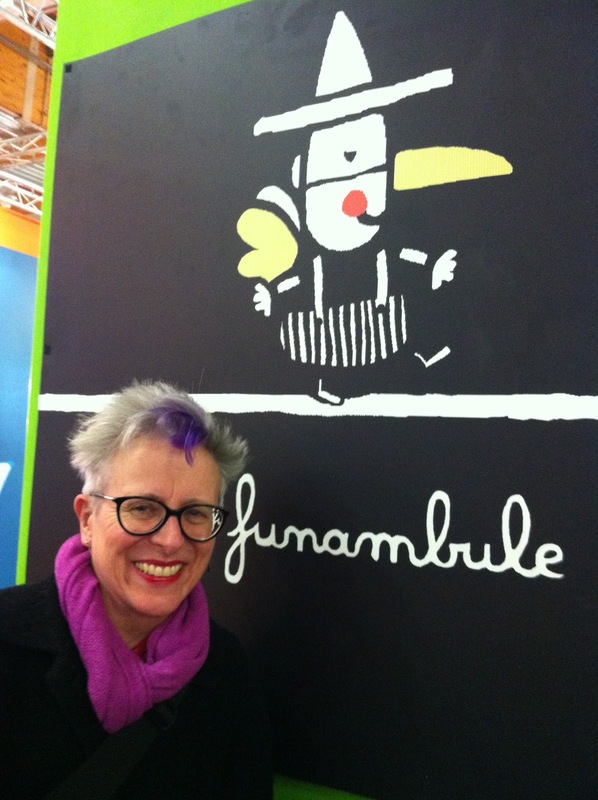 Hilarious comic illustrator, author and cartoonist friend Sally Kindberg who is also published by Bloomsbury, came with me — an ideal travel companion. We lodged close to the fair thanks to another friend, the illustrious Doug Cushman, fellow author and illustrator at Hen and ink Literary Studio. 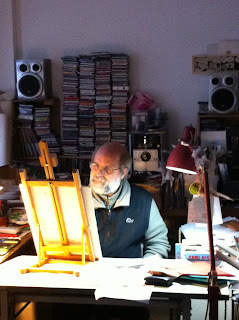 When we arrived Doug was painting a watercolour of an owl in his Paris studio. 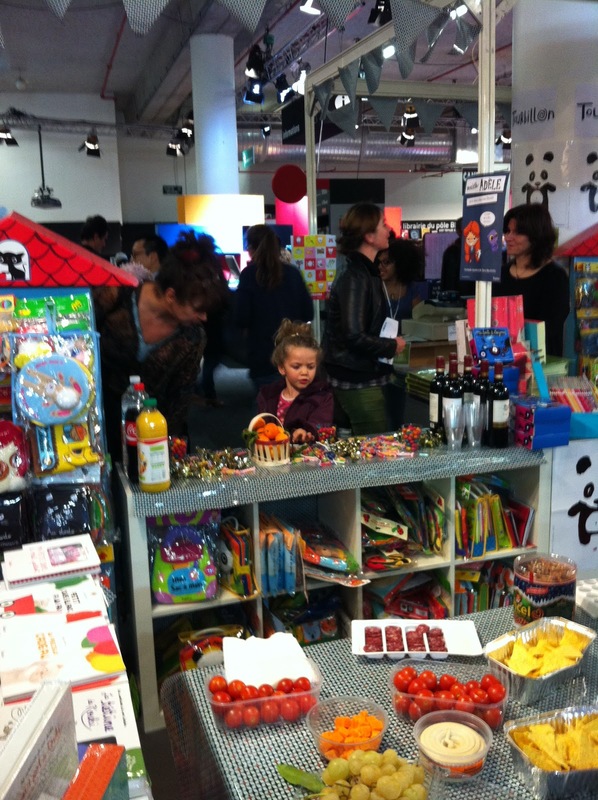 A couple of hours later Sally and I went to the grand opening of the French kids book fair. 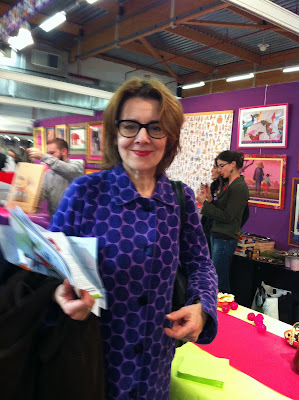 Sally took a pic of me in my spotty jacket. I’m holding a pile of bumpf about the fair. 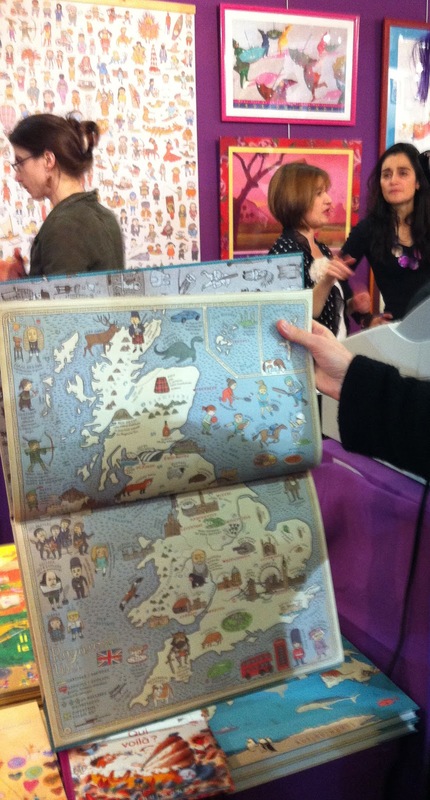 Imagine over 300 children’s publishers showing their year’s output and more, in stands across two huge floors. Well over 150, 000 visitors brave the trip into Montreuil, an eastern suburb of Paris to look at books and attend events for kids and publishing pros. 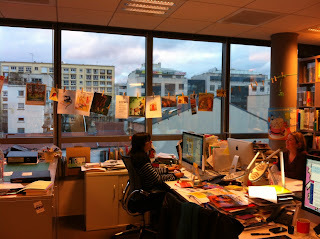 I’ll confess I blogged last year too, enthusing about this mecca for illustrators, authors, kids and book lovers. I just can’t resist going on about it! What is it about this particular children’s book fair that stands out from any other? One big difference is that kids can attend, not just the industry pros. They come with their parents or schools armed with a few euros. They queue up to watch illustrators and authors sign their books. There’s a buzz around books which older kids notice. 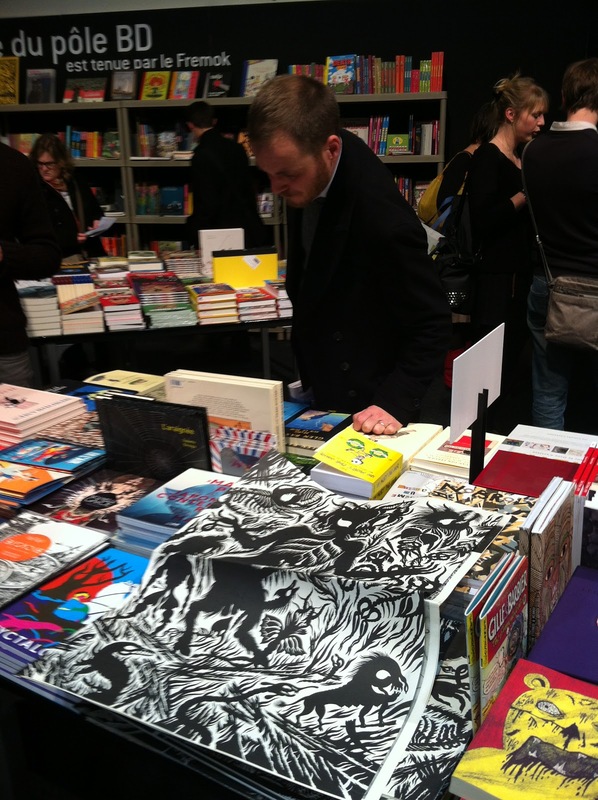 Yes, it’s cool to look at books. Another feeling you get strongly here is real pride in the produce. It speaks for itself. There’s not so much glitzy corporate marketing and hard sell. Yet it’s a fair that seems to help even the smallest publishers survive. From the huge variety of books and inventive formats it seems they can afford to take risks and publish the books they love. 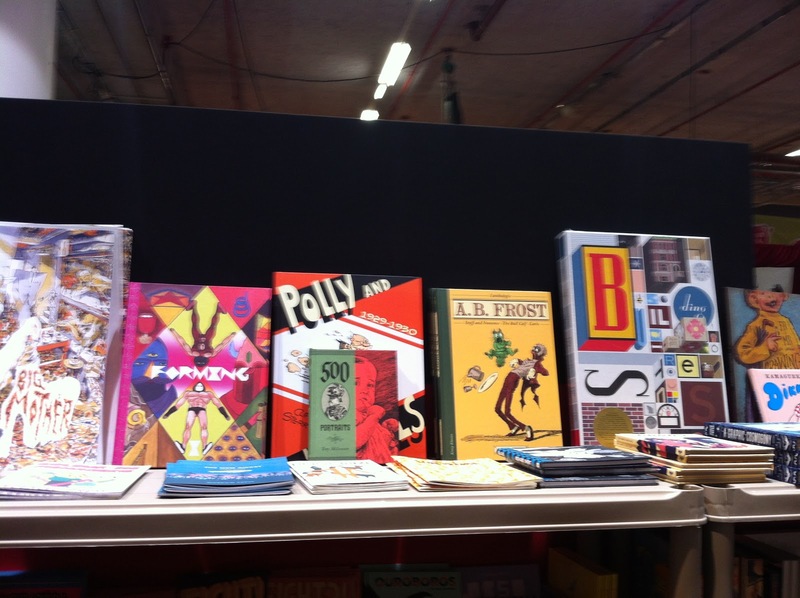 This year it was great to see Nobrow come from London who also take pride in publishing stand-out books. 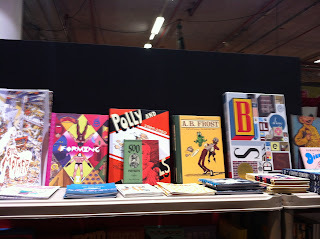 Sally loved this beaked tight rope walker on the wall of a publisher’s stand. Wish we had noted the book it was from – anyone know? 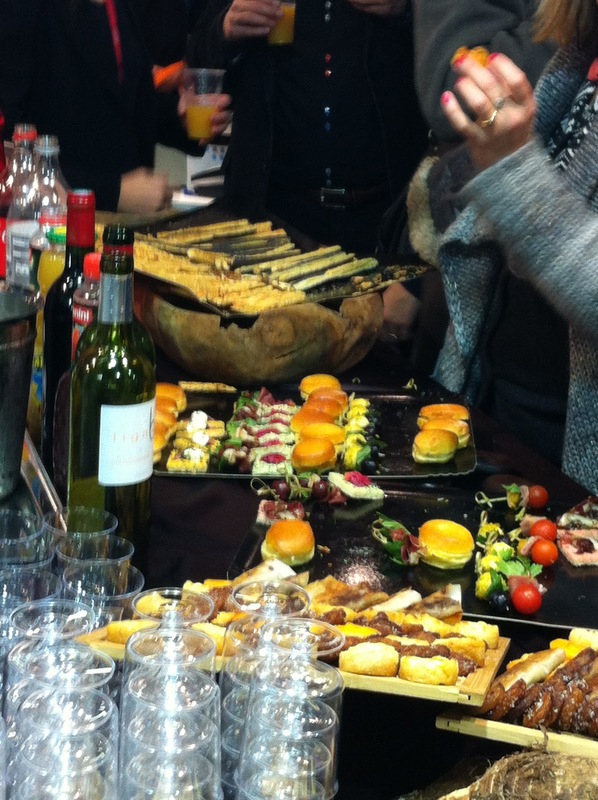 The opening night is not all about bribery with food and drink.. The day after, I took Sally to my French publishers, Bayard. They’ve moved to a huge modern building south of Paris in the suburb of Montrouge. It’s a long walk from the book publishing end to the magazine end of the building. 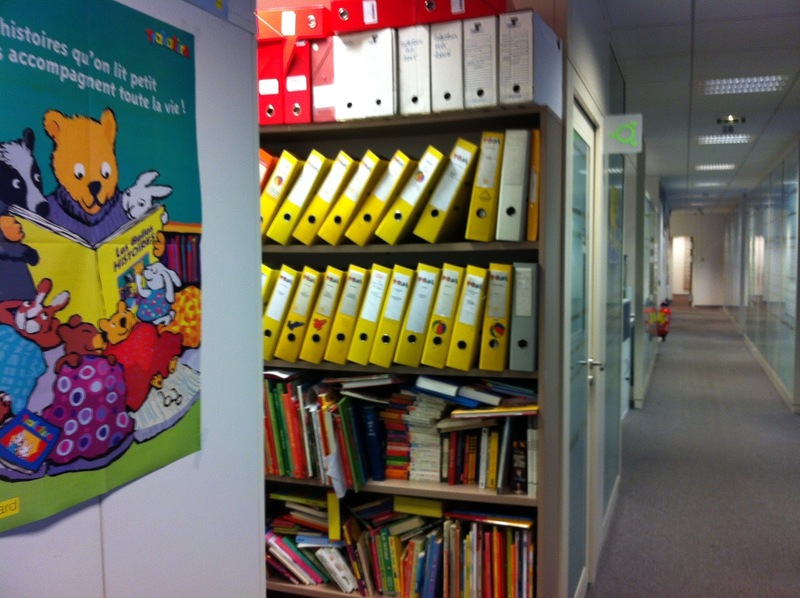 As we got to the offices of Belles Histoires and Tralalire, I noticed a couple of old posters I’d done a while ago were up on the walls. Check-out the washing line of illustrations up in the Belles Histories / Tralalire offices! 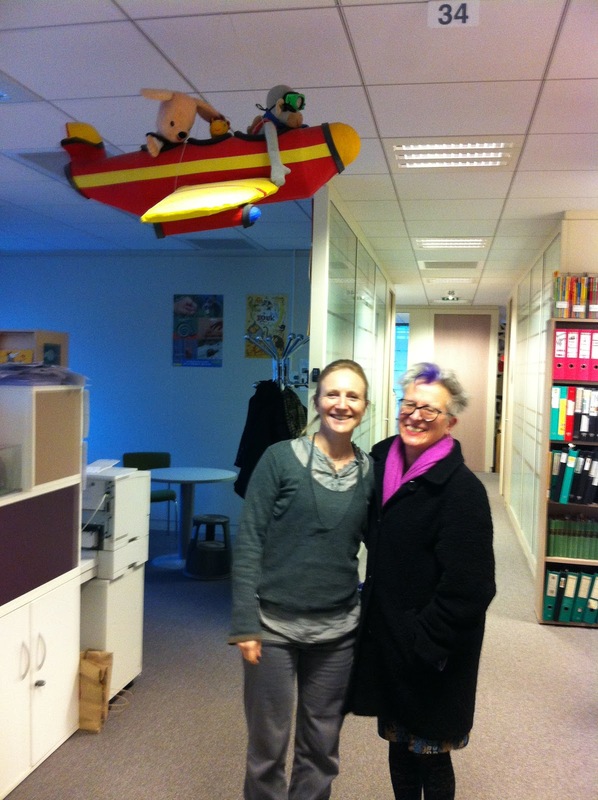 And here is Sally again, with Marianne Vilcoq, an illustrator herself and the hard-working Belles Histoires art director — just before we took off. My only regret is I didn’t have time to catch up with more friends in Paris. Still Sally and I had a hilarious meal at L’Atmosphère by the Canal St Martin, with some of the other Hen and ink authors and illustrators, Jeanne de Sainte Marie, Sarah Towle, Mina Witteman from Amsterdam, and also a recent SCBWI member, Jion Shebani whose portfolio I had admired a few days before at the Winchester conference. Bridget Strevens-Marzo is an illustrator-author who combines her love of color, painting and play in creating books for younger children. She is sought out for her talent for inventing visual sub-stories, with warm, lively and original characters such as the little hippo in the award-winning international co-edition, Kiss, Kiss! (Little Hare/Egmont/ Simon & Schuster US) and her cast of animals in her French children songs and in Bridget’s Book of Nursery Rhymes. She is also at home with both story and concept books. Her graphic The Big Book for Little Hands (Bayard/Tate Gallery UK/ Abrams US) was shortlisted for the British Book Design Award, and the most recent US/UK book she illustrated, Mini Racer (Bloomsbury), added another star to a good collection of reviews. Bridget also enjoys weaving her own stories and playful paths around pictures. She has learnt from working in an international children’s multimedia start-up and later for Bayard Press that working with a publishing team is like having a party with a purpose. 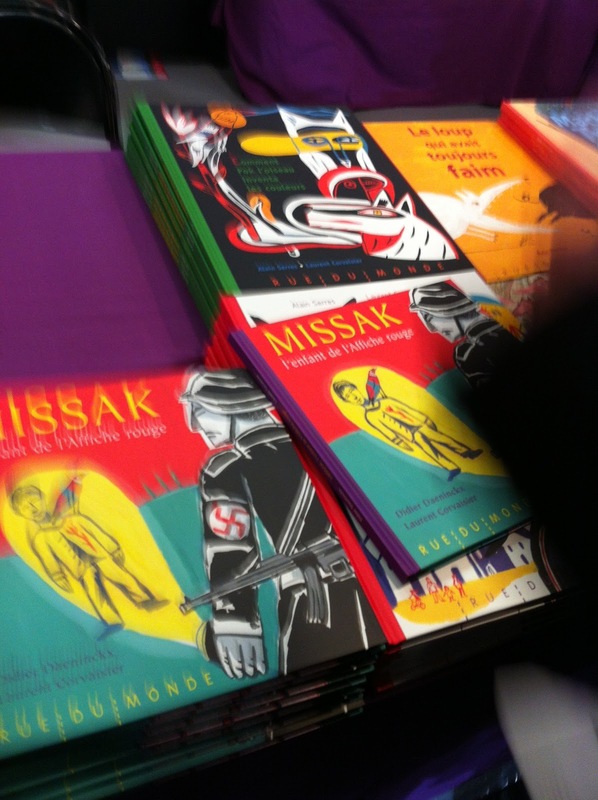 She also enjoys sharing her work with young and old at book events and workshops across the world. As it’s Picture Book Month (in the middle of NaNoWriMo! ), we’re taking a look at that most wonderful of forms, THE PICTURE BOOK. You may be wondering why, when the title of this blog is “A Bearful of Stories,” I’m starting off with a penguin (not just any penguin, mind you). Basically, I suppose we could have called this “The Friendship Issue,” but then we (Carmen and I) clocked how many picture books feature bears. So, as I’ve read an armful of terrific new and upcoming picture books lately where the text and the illustrations sing together brilliantly (and seamlessly) and where the message is quieter and the pallets boldly calming, we’re starting with the funny bird and ending with the burly bears. Rest-assured, a penguin is not a bear (though they are both fantastic characters). In case you were wondering about this logic. I won’t even go into how the kiss fits in. and the upcoming Bear and Bird (and Frog) by Gwen Millward. Each of the above titles features gentle humor and love, whether between a parent and a child or between friends. In Penguin & Pinecone, Salina Yoon manages to show undying love of two very different characters (Penguin and Pinecone…) and how they adapt to their different needs. Plant a Kiss – Here, we meet Little Miss who, almost in the role of The Little Red Hen, brings together the neighborhood and the world by just the simple act of planting a kiss, granted a very special gardeny kiss. The video is fun, too. In one of the finest examples of picture-book metafiction in recent memory, Banks and Hallensleben offer a spot-on portrait of the intimate, roundabout nature of reading with a child. The clever structure lets readers peek in as a mother and child read and discuss a book, then move into that book, fully sharing in the story. It’s a superb model of the value of reading together. The Bear and Bird books play up relationships like Bert and Ernie, Frog and Toad and Bear and Mouse (in the Bonny Becker and Kady Macdonald Denton’s wonderful creations, A Visitor for Bear et al). In Bear and Bird, Bird learns kindness and selflessness and what keeps a friendship (relationship!) going. In the upcoming Bear and Bird (and Frog), Bear values Bird and Frog does too (in a big way – this is my version of avoiding a spoiler). Interestingly, the majority of characters in these books are BEARS. Bears are symbols of calm and stoic strength. 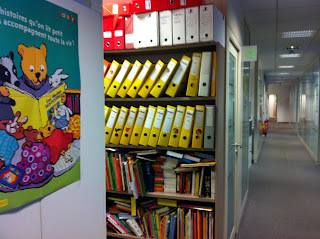 They also know when to escape (hibernate). The Bear in the Book breaks away from the tradition of bear books exploring the beary-ness of life (under their coats we know they are just big, lumbering kids). But, in the end, no matter what fur you wear, all these books are about kindness and love. And that makes me feel warm and fuzzy all over and beg for someone to READ IT AGAIN! Happily, we can explore bears and picture books with Hen&ink’s Carmen Oliver. She also happens to have a couple of terrific bear books up her sleeve that she’ll tell you about. So, curl up close to the fire and listen up. We’ve a bearful of stories to tell. Chilly or stormy nights demand a steaming cup of cocoa or tea and a good book to chase away the howls of the wind. That’s why I’ve put together a picture book post on some of my favorite characters, who happen to all be bears. There’s something so inviting and soothing about a bear, their cozy fur, big paws, generous girth and the fact that they love naps. What’s not to love about bears! I guess I’m not the only one as the New York Times reviewed several books for children on Sunday, January 21, 2012 and I’m including the article In The Company of Bears by Pamela Paul because these books sound adorable and worth checking out. One of my favorite bear books of all time is We’re Going on a Bear Hunt by Michael Rosen and Helen Oxenbury.It’s a classic tale that never gets old. I love making the sounds with my kids as we read this book aloud. Don’t you? A series favorite of ours began with A Visitor for Bear by Bonny Becker, illustrated by Kady MacDonald Denton (Candlewick Press, 2008) and the latest book out is The Sniffles for Bear. If you’ve never read this series than you’re missing out on one of the best friendships to come along since Arnold Lobel’s Frog and Toad series. Mouse and Bear are the perfect companions. Most of the time! These books are clever and funny and touching. And what about the gorgeous illustrated dancing polar bears in Nancy Tillman’s On the Night You Were Born (Feiwel & Friends, 2006) or the black bear in Wherever You Are My Love Will Find You (Feiwel & Friends, 2010) Magical. Whimsical. Heartfelt books. You may have seen some of them this past Christmas during the holiday season as they were featured in Kohl’s stores across the nation. I’ve always been drawn to bears in part because of their massive size and strength. No one messes with a bear and it’s one of the reasons why they make such good characters in picture books. They’re protectors. But sometimes they need protecting in real life and that’s why I was moved to write the picture book A Voice for the Spirit Bears: The Simon Jackson Story, about a boy who has dedicated his life to saving the ghosts of the North. To learn about these rare bears and Simon Jackson, you can visit the Spirit Bear Youth Coalition and lend your voice to the campaign, too. In closing, do you have any favorite books with bear characters you enjoy reading? Care to share? Or maybe you’re writing your own “bear” book. And if you are, I say good for you! I think there’s always room for one more. Let me know your favorite bear books, I’m sure there’s a few out there that I’ve missed over the years. Let us know your favorite bear or other picture books! We’ll make a tally and see if, say, mice overrun bears as characters or if penguins are the new badger. And then we’ll make a PIE CHART! Watch this space (but first send in your vote via comments). When not pondering bears, Erzsi Deak is a fowl-obsessed agent and founder of Hen&ink Literary Studio, writer and editor. Her book, Period Pieces: Stories for Girls, with Kristin Litchman, featured a baker’s dozen of stories by some of our favorite writers. E-book coming soon (very small apologies for the blatant advertising). 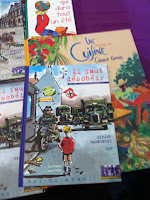 Carmen Oliver is a children’s writer represented by Hen&ink Literary Studio. She’s a contributor to ReaderKidz and is the Assistant Regional Advisor for the Austin Society of Children’s Book Writers and Illustrators (SCBWI). 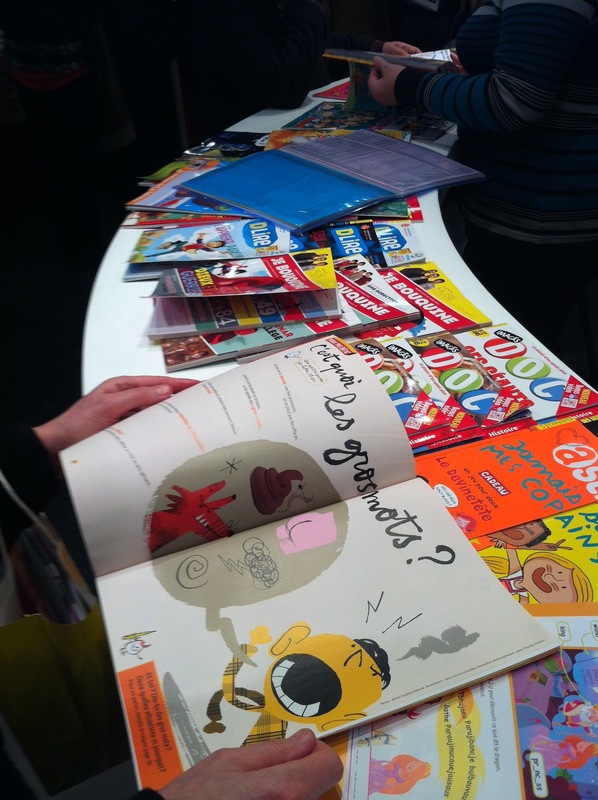 This post is Part II on picture book advice from the 17th Texas Book Festival in Austin, Texas. This time, I wasn’t in the audience taking notes for the session but moderating Just the Write Word panel with picture book authors Liz Garton Scanlon and Candace Fleming. Both authors read their books as they are meant to be shared and set the tone for our talk on picture book language. As Candace read, the audience chimed in with the refrain and title of the book Oh, No! (illustrated by Eric Rohmann) and Liz left attendees inspired to go home and make art with Think Big (illustrated by Vanessa Brantley Newton). When I asked these ladies what they thought made a good read-aloud, they both agreed that musicality and language is at its heart. Whether the story is written in rhyme or prose, every syllable and word has a beat and cadence and has to musically resonate using many different senses. This of course is by no means an easy feat and comes from many, many revisions. Liz finds the right words by rewriting stanzas approximately forty times. Sometimes stanzas get dropped because the rhyme doesn’t work. And she admits she doesn’t know how to get to the good one without writing the forty horrible ones first. Can’t we all relate! Liz’s revision example from Noodle and Lou (illustrated by Arthur Howard) showed how her language went from grey (early draft) to gorgeous (final draft). Everybody has a bad day now and then. Noodle has bad days now and then. Some days don’t go well, right from the start. Noodle woke up with a rain-cloudy heart. Is there a main character? What are the obstacles and/or problems? Who is my reader/audience and who will be most interested in the story I want to tell? After she finds the story, she focuses on the language because language serves the story. Story informs the language. In the revising of Oh, No! 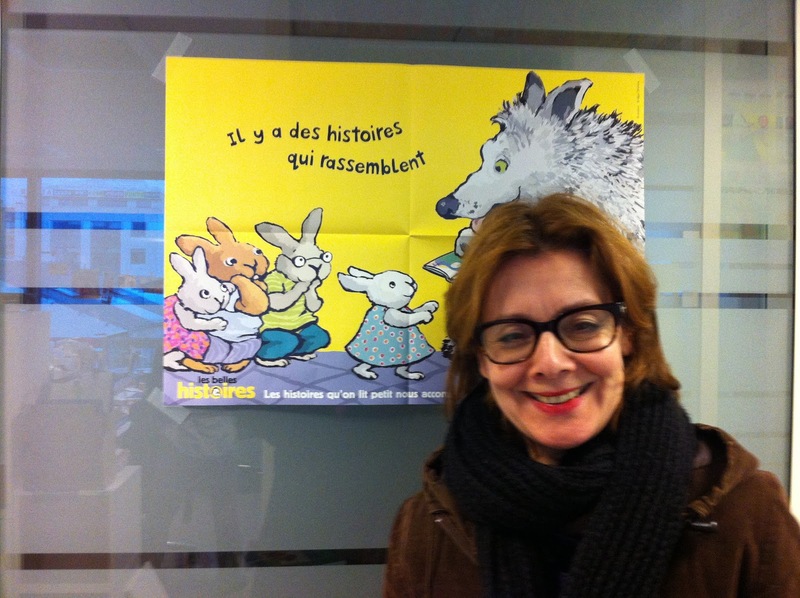 it wasn’t until she and illustrator Eric Rohmann laid out the text that they discovered the rabbit character had to go. Why? The rabbit didn’t add anything to the story. The rabbit seemed ordinary and they already had an “ordinary” animal (mouse). If you’re struggling to create or find the page turns in your story, I challenge you to create a mock-up or dummy picture book. You don’t have to be an artist. No illustration skill is needed at all. I promise. It will help you make decisions about your page turns. What scenes or characters to cut. Fix transitions and illuminate the overall story arc. Have fun with this! Click HERE to follow easy instructions by author Darcy Pattison. So in closing, I just want to emphasize what Candy and Liz both reiterated throughout our panel. Play with the language. Let the words skip across the page. Revise your story. Read it out loud. But don’t forget to find your story, first. Then make art! Carmen Oliver left behind a career as a programmer analyst to follow her dream of inspiring children with stories. She writes fiction and nonfiction for preschool to upper elementary and her books are infused with strong themes of family, friendship and making a difference. Her published work has appeared in family and children’s magazines and she’s represented by Hen & ink Literary Studio. She is a regular contributor for ReaderKidz, a website devoted to fostering a love of reading in kids, K-5 and also serves as the Assistant Regional Advisor for the Austin chapter of the Society of Children’s Book Writers and Illustrators (SCBWI). She divides her time between living in Canada and the United States with her loving husband, three beautiful children and one scallywag dog. Cool dry air descended on the Austin capitol for the 17th Texas Book Festival but the authors and illustrators shone under blue skies. Many attendees had difficulty choosing which sessions to attend because of the smorgasbord of topics but be that I was moderating for award-winning authors Candace Fleming and Liz Garton Scanlon on Sunday, I focused on picture book panels and events. One of my favorite comments from the weekend came during the We Wrote a Picture Book Together and We’re Still Talking panel with authors/illustrators Philip C. Stead and Erin Stead and Eric Rohmann and Candace Fleming. All the panelists agreed that understanding how children see the world is the key to successfully creating picture books that resonate with kids. Candace and Eric visit art museums a lot, and she pays particular attention to how children interpret art. They may not have the verbal sophistication to describe the art but they know how to convey the right feeling. Eric said an example of conveying the right feeling is the Steads picture book Bear Has a Story to Tell and how they captured an autumnal sense and childlike longing. It’s difficult to create this unless you’re really connected to your childhood or still living it. Philip Stead thought Bone Dog by Eric Rohmann tapped into this as well and was the best unknown book of 2011, a tip I capitalized on after the session ended. So if you’re a picture book writer or illustrator how do you go about understanding how children see the world? Be an observer like them, exploring and noticing the tiny details. The cat that scampers into the road gutter, the tiny hole in the fence to peer through, and the rocks they overturn to find pill bugs. Listen to them talking in classrooms, doctor offices, playgrounds and art museums. Read, read, read. Philip attributes writing his first draft of Bear Has a Story to Tell in forty-five minutes to reading over 20,000 hours of children’s books. Of course, he’s quick to point out that the language wasn’t perfect but all the scenes were there and he along with Candace both write freehand on lined paper in order to slow down and think about what it is they want to say. Focus on what intrigued you as a child. Was it stepping on an ant hill and watching the soldiers defend their fortress, releasing a balloon into the sky and seeing it slowly disappear in the atmosphere, or throwing a ball onto a roof and guessing which side it would roll off? Then take your pen or pencil and push your chair back from the computer screen and draft a story or two, the old fashioned way. It seems to be bearing fruit for Candace Fleming and Philip C. Stead. So shake your apple tree and see what falls out. Check back on Friday, November 16, 2012, for Part II on picture book advice from the 17th Texas Book Festival!